Time to post again. 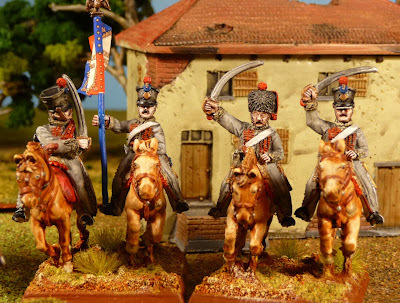 I have been industriously working on the 6th Corps, but needed a break from the blue infantryman. 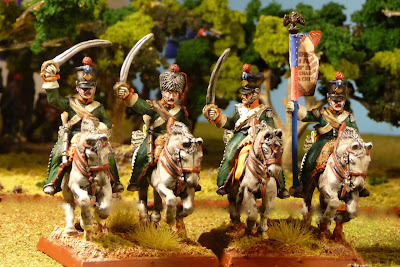 I felt some cavalrymen would be nice, so decided to do the cavalry brigade attached to the corps. This was a pretty small brigade with just 8 squadrons of troopers. I wanted to put in all figure types, but had to leave out the musicians as I would have had no troopers! So each 4 figure group has an officer, standard bearer, elite and trooper. 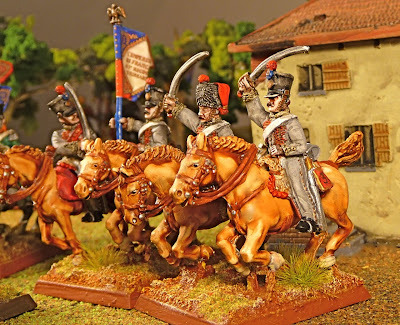 When I paint the next unit, I will leave out the officer. Brigadier-General Auguste Étienne Marie Lamotte was the officer in charge of the brigade, I can find little about him. 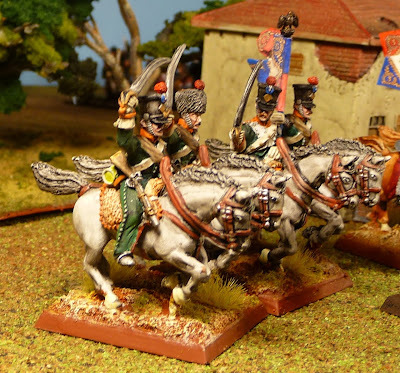 He started off with the 4e Dragoons, but here he is in a nice Hussar uniform. All the figures are Front Rank, I did the Lamotte figure about 16 months ago and my technique has really progressed. I really enjoy using washes over a white primer. Anyway, time to get back to the blue, 25e légère. À la prochaine. They look superb! I've only ever used black undercoat but I think the effect you have achieved is excellent. Is it a difficult technique to master? I find it infinitely easier then a black undercoat, you need to let the washes do their work. I seldom have to add a highlight. However I believe that they wore white lace? Actually, red lace over grey dolman and pelisse looks better and nicer! I just could not resist the red lace once I say it in Cueto's illustration, I wish my figures had the tall plume. Nice brushwork. I really like the work on the horses - some of the nicest ones I've seen. The horses are very easily done, prime white then 1 coat of GW Sepia or Black on the horse's body with 3 coats on the mane and tail. Then paint the leather, metal and eyes and you are done.